Before you buy any anti-snoring device, make sure you know the reason why you snore. Some people snore because of minor issues only like their lifestyle, health issues or maybe the temperature in the room. If it is very serious or you are suffering from Sleep Apnoea, you can consult your physician or doctor and he might suggest helping you to stop snoring. Most commonly known as Anti-snore Acupressure Ring and is made of a metal band that fits on your small finger. It was invented in 1999 in Australia and the idea is based on the Chinese Medication — Acupressure. It is worn on the smallest finger and it applies pressure to the nerve points which control airway and reduce snoring. Must be worn 30 minutes before going to sleep and while sleeping. It was recommended to apply it on the left hand but it can be applied to both if you want to. It is quite hard to believe that this ring will work. Others who have tried it have a negative comment about it. It’s very inexpensive, there’s no harm if you want to try it. We have two different snore sprays; Nasal Spray and Throat Spray. Nasal Spray is used when snorers nose are clogged up with mucous. When the nose is clogged we are forced to breathe through our mouth and not to the nose. This is followed by snorts or gasps. And the second spray is Throat Spray. Throat Spray prevents our throat from being dry and sore. It lubricates our throat including our tonsils and muscles in our throat that makes sounds or vibrations when we sleep. Anti-snore pillow will make your head and spine aligned in one position regardless of the position you make while you sleep. This will help in clearing the breathing airways and will help to improve the quality of your sleep. You can use the pillow with your arms under the pillow which will help you to sleep on a sideway position. This is made of cloth like or stretchable fabric that will support your jaw when you are sleeping. It will keep your mouth close and will force you to breathe directly to your nasal passages. This will also make an individual to breathe correctly when sleeping. Wearing Chinstrap will also allow you to sleep in a different position you like. This is very comfortable when you’re sleeping compare when you wear a mouth guard or any oral devices. This is worn over your head and around your chin. But before wearing this, make sure that you have cleaned your nose before going to sleep. This is worn at night, it a soft flexible gum shield and holds the lower jaw to open up the air passages and helps you to stops snoring. It will be kept in place even if you change position when you sleep. It also allows normal breathing and prevents the lower jaw from falling back if you are lying on your back. It also very convenient to use as this doesn’t require any fitting. This doesn’t contain any hazardous chemical. No need for sterilization and easy to wash and clean. A mask worn through your mouth and nose and assist you to breathe properly. This is used when your nose is clogged up with mucus. Too much mucus in the nose and throat will aggravate snoring because they tend to breathe through their mouth. Majority of these sprays are harmless and organic. This is used to lubricate the back of your throat to lessen the vibrations that your throat makes and helps shrink swollen tissues in the throat and helps dry built-up mucous in the sinus passages. It reduces loudness and frequency of snoring. You don’t need to wear anything on your mouth to keep it close. It has no side-effects, non-drowsy, no contraindications and non-addictive. A person should apply 3 sprays at the back of the throat 30 minutes before bedtime and not to drink or eat after applying. 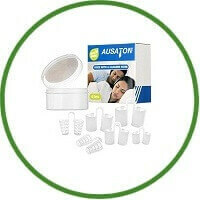 Though expensive, continuous use may help to reduce and to stop snoring. But the result may vary from one person to another. Some says it doesn’t work from them but some do. This spray is only use to cure simple snoring. But if a person is suffering from Sleep Apnoea, it is better to consult a doctor. This prevents your throat from being sore and dry. It relieves snoring or may reduce it. It is made up of harmless ingredients that consist of natural oils that lubricate the throat including the tonsils that makes sound or vibrations when you sleep. It uses a unique process that helps older people in sleeping. It uses a wave of gentle vibrations to the skin surface when it detected the first sign of snoring. These vibrations will cause your body to change positions that causes you to snore. It enables user to get plenty of sleep at night. If you are uncomfortable using a headgear, mask, mouthpieces or nasal sprays then snore ender is the right for you. It is painless and easy to use.